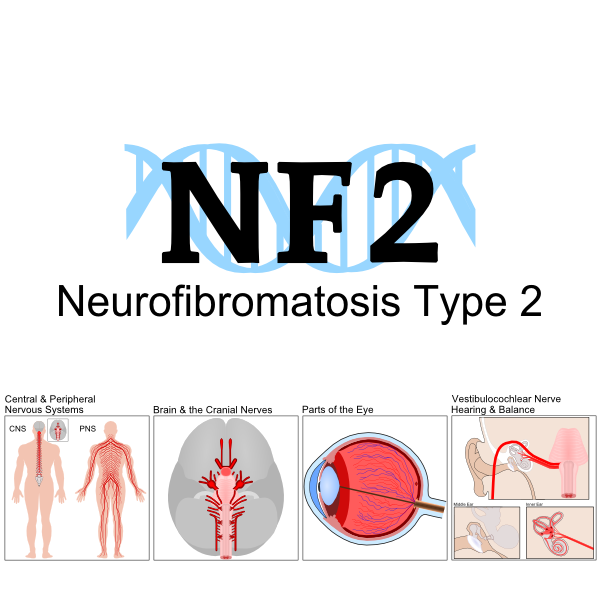 For individual's with neurofibromatosis type 2 (NF2), schwannoma tumors grow as a part of up to eight (8) of the brains twelve (12) cranial nerves. 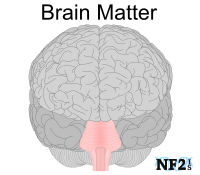 Some individuals with NF2 only develop tumors on one pair of cranial nerves. 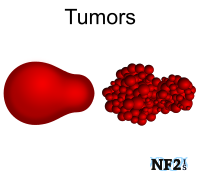 Variations of how and when tumors develop vary from person to person. 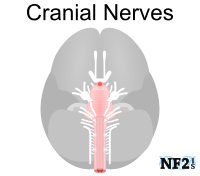 The hallmark location often used as part of the diagnosis criteria for individuals with NF2, are tumors along cranial nerve 8 (CN8), the vestibulocochlear nerve. The functions of CN8 are hearing and balance. 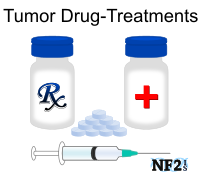 Growth of tumors along CN8 can also damage CN7, the facial nerve. The function of CN7 is facial expression. 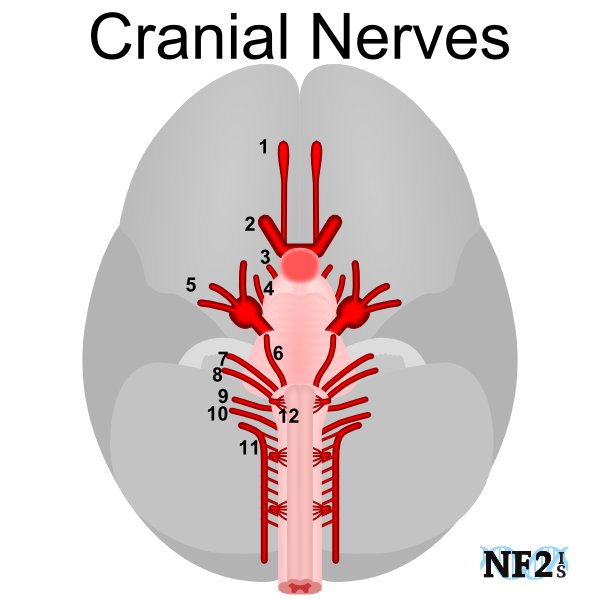 Each of the cranial nerves controls a specific function, sense, or sometimes both. 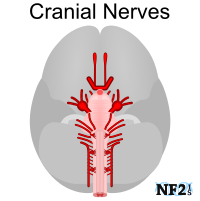 CNI (Cranial Nerve 1), is the only Cranial Nerve that can regenerate completely if damaged. 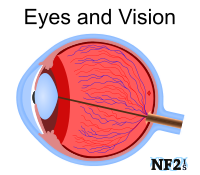 CNII (Cranial Nerve 2), carries Vision to the brain. This nerve does not contain Schwann cells. CN IV (Cranial Nerve 4), controls eyeball movement, rotating, up, down, left and right. CN V (Trigeminal Nerve), three (3) branches: Meets brainstem at the Mesencephalic nucleus, Principal sensory nucleus, Spinal trigeminal nucleus, and Trigeminal motor nucleus. Ophthalmic Nerve (V1): Muscles of the eyelids, eyebrow, forehead, and nose. This branch affects the glands for tear production and mucous membrane of the nasal cavity. Maxillary Nerve (V2): Sensation from the maxillary, nasal cavity, sinuses and taste. 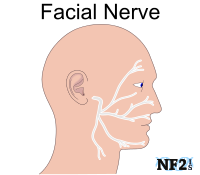 Mandibular Nerve (V3): Face Sensations and Muscles for biting, chewing, and swallowing. CN VI (Abducens Nerve): Meets brainstem at the Abducens nucleus for eye movement. CN VII (Facial Nerve): Meets brainstem at the Facial motor nucleus, Superior salivatory nucleus, and Solitary nucleus. CN VIII (Vestibulocochlear Nerve): Meets brainstem at the Vestibular nuclei (w. subnuclei) and Cochlear nucleus (w. subnuclei). CN IX (Glossopharyngeal Nerve): Meets brainstem at the Solitary nucleus, the Spinal nucleus of the trigeminal nerve, lateral nucleus of vagal trigone, Nucleus ambiguus, and Inferior salivatory nucleus for muscles of the tongue, tonsil, and pharynx. Muscle Control: Control of the Stylopharyngeus Muscle, impairment of this muscles can affect swallowing and speech. CN X (Vagus Nerve): Meets brainstem at the Dorsal nucleus of vagus nerve, Nucleus ambiguus, Solitary nucleus, and Spinal trigeminal nucleus. Muscle Control: Muscle control that controls heart rate, sweating, esophagus, and digestion, as well as many involuntary muscle movements in the mouth, including speech, and breathing. Sensory Control: Feeling in the ear canal. CN XI (Spinal Accessory Nerve): Meets brainstem at the Spinal accessory nucleus, and Nucleus ambiguus for muscles used in neck and shoulder movement. CN XII (Hypoglossal Nerve): Meets brainstem at the Hypoglossal nucleus for muscles of the tongue. Widemann, B. C., Acosta, M. T., Ammoun, S., Belzberg, A. J., Bernards, A., Blakeley, J., ... & Morrison, H. (2014). 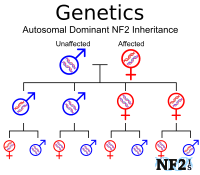 "CTF meeting 2012: Translation of the basic understanding of the biology and genetics of NF1, NF2, and schwannomatosis toward the development of effective therapies." American Journal of Medical Genetics Part A, 164(3), 563-578.